Taking place in Seattle, Washington on September 26 - 30, 2012, the 9th annual Decibel International Festival of Electronic Music Performance, Visual Art and New Media has been announced, featuring headliners Kimbra, Carl Craig, Matthew Dear, Fennesz, John Talabot, Ariel Pink, and Actress, Nina Kraviz, and Baths. In addition to the headlining acts, the festival will feature Dragonette, Emancipator and Yppah. Following the “artist a day” approach, the rest of the musical lineup (60 more acts out of 120) will be announced on June 27th with the entire program of educational programs, film festival, after-parties and boat-parties announced on July 11th. 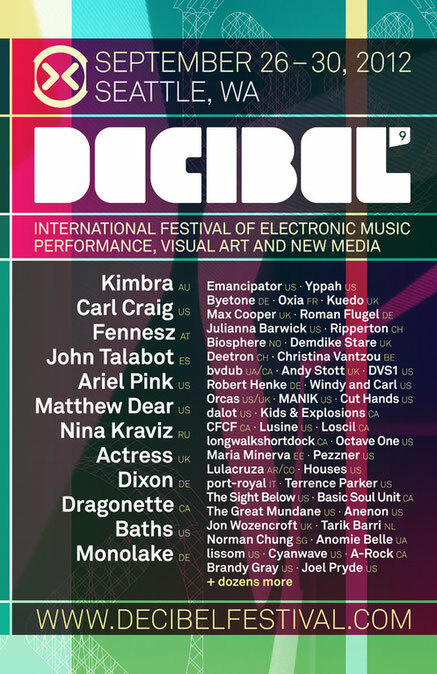 In year nine, The Decibel International Festival of Electronic Music Performance, Visual Art and New Media is quickly becoming the SXSW of the swelling cultural phenomena that is electronic music. The Seattle based festival expects to hit 30k attendees this year with over 170 artists from 19 different countries, plus 72 educational speakers, making Decibel Festival an oracle for the growth of the entire international electronic music scene. The entire festival takes place over a five-day period at over 14 venues in Seattle, Washington. “In 2003, I founded Decibel Festival with the mission to redefine underground electronic music and visual art as a unified performance medium, while establishing the Pacific Northwest as a vital hub for electronic music culture in the United States. At the time, "laptop performance" was still shrouded in mystery and most electronic music performance consisted of turntables, CDJs, and a mixer. Electronic music in America had receded from the rave boom back to small communities of loyalists caring more about the music itself than its potential to generate revenue or fan base. This has been the community that has supported Decibel from day one and I'm thrilled they are still at the heart of Decibel today. Fast forward to 10 years and electronic music is pervasive in nearly every facet of mainstream American culture and we continue to have mixed emotions regarding this surge. As avid supporters, performers, producers, and fans of electronic music for over 20 years, we can't help but feel nostalgic for a time when underground warehouse parties and independent record stores were the predominant outlet for electronic music discovery.